This is a Sling Shot for the masses. The Reactive Sling Shot will work for a lifter who benches 75LB to a big meat head who wants to bench 600. This Sling Shot will NOT impede on your form in anyway, it will actually improve your form. Novice lifters will be able to slide it on and enjoy moving heavier weights right away. The main difference between The Reactive Sling Shot (Blue) and the Original (red) /Maddog (black) is that the Reactive Sling Shot is more pliable, flexible, comfortable and a little easier to put on. The Reactive Sling Shot will allow you to train pain free so you can focus on the weights and not how much your shoulders and elbows hurt. Use the Reactive Sling Shot for benching, pushups or for assistance on ring dips and Muscle Ups. 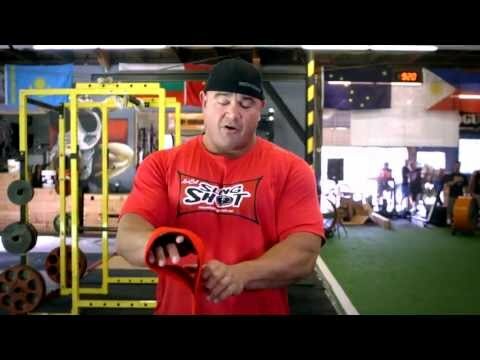 The Sling Shot was invented by world class powerlifter Mark Bell (545LB raw Bench, 854LB equipped Bench) to help lifters bench more weight safely and without pain. The Sling Shot is easy to put on, easy to use and will help maintain correct form. It is suitable for lifters of all ages and strength levels. Reactive Sling Shot is rated 5.0 out of 5 by 21. Rated 5 out of 5 by ronski from Has great utility I originally brought this to help out on my bench press. The problem I was facing was that after a cycle of 531 when it came to 1RM testing I was simply not use to balancing the 1RM weight down onto my chest. The slingshot gets me over this hurdle by letting me "practice" at higher 1RM values to get the "feel" for the heavier weight. The net effect being I have a lot more confidence in going for 1RM on bench. The other good thing the sling shot has allowed me to do is work my dip form and strength (following shoulder injury) in a controlled and safe manner. This item is always in my gym bag! Rated 5 out of 5 by Mick from Excellent training aide I am a 53 year old powerlifter, who has suffered through a torn pectoral, a torn bicep, and my most recently a torn tricep. I used the reactive slingshot for the first time last night. I can honestly say it was the best bench workout I have had in years. It acts like a bench shirt without all the hassle of putting one on. Rated 5 out of 5 by Big Pat from Amazing After seeing the sling shot for several years, I decided to try. The product is amazing. It will add pounds to anyone’s bench, but more importantly, it takes a lot of the pressure off of my shoulders. It also allows me to crank out more reps without a spotter. It is reasonably priced, so it won’t break your wallet. Every lifter should try. Rated 5 out of 5 by Dr DC from It works! 49 yo and shoulder dislocation 30 yrs ago. Used it twice, really builds confidence in avoiding injuries. Easy to use. Pays for itself in dividends of allowing me to show off my true strength to the wannabes. Rated 5 out of 5 by Gym Goer from SLING SHOT I bought this product last year and let me tell you, it was worth every cent...I'm up to 500 push ups. Rated 5 out of 5 by Kaos5150 from Perfect!! As soon as I got it I put it to work. Works perfectly. Rated 5 out of 5 by Coach Clay from It Actually Works! I have purchased a lot of fitness equipment or supplements over my lifetime, with little overall return of these small investments, . . . Until . . . I purchased a slingshot. This really works exactly as advertised. I had been stuck on my max bench for almost a year with little progress, and although I did not expect a lot from trying the slingshot, it was fairly inexpensive so I figured it was worth a try. After one month, my max bench has increased by 25%, which is a huge step for me. It was fun using the slingshot to help me lift much heavier weights, bit what is amazing is how using those heavier weights makes such a big difference on your bench without the slingshot. THIS BENCH HELP IS AMAZING and pure genius for its simplicity. I just wish I would have discovered it years ago. 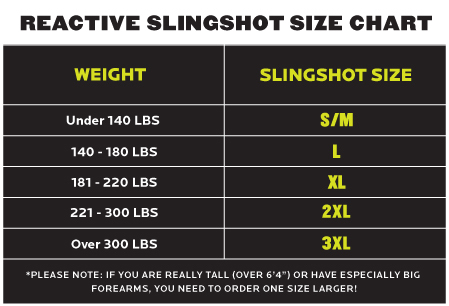 If you want to improve your bench press, buying a slingshot is the way to go. Rated 5 out of 5 by Just Chuck from Works like they said it would. My son bought me my first one. It was the blue reactive slingshot. I have bad shoulders and my lower back is fused. It took the strain off my shoulders because my feet don't reach the floor so it's all upper body. It's not cheating it actually just helps my form and it helped me get 400lbs. I bought the red original slingshot and the yellow. I'm going to get the last one for my next goal of 500lbs.